NEW ORLEANS, LA – Our love affair with horses starts with their amazing athletic ability, explained H. Edward Durham, Jr., CVT and Veterinary Technician Specialist (Cardiology), presenting at the ACVIM Forum. Many factors influence performance, including the physiology and fitness level, arrhythmias, heart disease, and inflammatory conditions. Understanding heart disease in horse is important for all horse enthusiasts. The evaluation of heart rate (HR) may perhaps be one of the simplest indices. It is well accepted that a lower HR at a given level of exercise is associated with better conditioning. The healthy horse has a resting HR of 24-48 bpm, but at peak exercise the HR may reach 240-260 bpm. By running a horse on a treadmill and attaching an ambulatory electrocardiograph (ECG) monitor, one can record the velocity of the treadmill when the HR reaches the target, and make an assessment of cardiac function. Another method is to measure the maximal uptake of oxygen possible for an individual athlete. The so-called VO2 Max is a measure of how much oxygen is being used by the muscles during exercise. A higher VO2 Max means better cardiovascular conditioning. Post-exercise HR has also been used to evaluate fitness; following exercise the HR falls quite quickly to a steady state higher than the resting HR for a short period then gradually decreases to normal. Horses with a higher post-exercise heart rate tend not to perform as well as those with lower post exercise HR. Rapid HR recovery post-exercise implies better cardiovascular health. Assessing the athletic ability of horses is an area of ongoing research. Many cardiovascular indices have been evaluated or are being actively investigated, but no single parameter has been found that will accurately predict a horse’s future performance. When a significant cardiac condition is suspected a complete physical examination should be performed. The examiner should observe the horse’s respiratory effort and rate, noting the patient’s jugular veins for distension or pulsation. Pulsations that extend higher than the lower third of the neck are abnormal, implying elevated right atrial pressure and tricuspid regurgitation. Mr. Durham noted that care must be given not to confuse carotid pulses under the jugular vein as jugular pulsations, as this false positive finding is especially common in thin horses. Hypokinetic pulses are associated with conditions that cause hypotension. Hyperkinetic pulses can be detected with significant aortic regurgitation. Both sides of the thorax should be palpated for the presence of vibrations or “thrills” associated with murmurs and for the apical impulse. A foal’s HR is around 80-120 bpm, higher than an adult’s, which gradually slows with age. Auscultation of the right and left hemithorax should be performed. Heart murmurs indicate turbulent blood flow in the heart. Two of the most common murmurs are functional murmurs and mitral regurgitation from valvular degeneration. Functional murmurs are usually systolic and occur in a structurally normal heart. Mr. Durham differentiated between mitral regurgitation from functional murmurs, saying the first typically lasts throughout the duration of systole, whereas functional murmurs tend to be restricted to early systolic to mid-systolic periods. Functional murmurs tend to increase in intensity after exercise. Echocardiography is the best diagnostic tool to identify the cause of a murmur and definitively differentiate between the two. Another common cause of a systolic murmur, especially in young horses, are ventricular septal defects (VSD). Murmurs associated with tricuspid regurgitation and VSD are best heard on the right hemithorax. Diastolic murmurs of aortic regurgitation are also heard in the clinically normal animal and are not uncommon. Continuous murmurs of patent ductus arteriosus can be heard during examination of young foals less than a week old but are extremely rare in horses older than that. Also, pre-systolic S4 and S3 filling murmurs may also be heard in clinically normal animals. 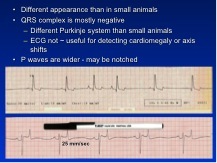 Figure 1 courtesy of Dr. Deborah Fine DVM, DACVIM (Cardiology). Most arrhythmias detected in horses are physiological with no clinical signs. Perhaps the most common is physiological 2nd degree atrioventricular block, which is related to strong parasympathetic vagal tone seen in horses and abates with exercise. Other arrhythmias of no clinical significance are transient sinus arrhythmia that may be seen following exercise, sinoatrial block, wandering pacemaker, and 1st degree atrioventricular block. If underlying cardiac disease is the cause of atrial fibrillation then treatment to control the ventricular response rate is preferred. (Figure 2) If no cardiac disease is present then conversion to sinus rhythm is preferred. An easy way to tell the difference is HR; if the rate is normal with AF, then there is less chance of cardiac disease being present. In most cases, AF is treated with oral quinidine sulphate administered via nasogastric tube. If after two days the atrial fibrillation persists, additional treatment with digoxin can be implemented. An alternative protocol calls for the cessation of treatment for 24 hours after the first two days of therapy. Some horses will convert during this drug holiday; if it persists then quinidine can be re-initiated as before. Recently, new antiarrhythmics such as flecainide and amiodarone have been evaluated for converting atrial fibrillation to a sinoatrial rhythm. Research is ongoing, with amiodarone holding promise; however flecainide may be limited to use in acute cases. Perhaps the boldest therapy, said Mr. Durham, is transvenous electrocardioversion, in which special electrode-tipped catheters are advanced into the right heart and an electrical current applied to defibrillate the atrial tissue returning the patient to sinus rhythm. Electrocardioversion requires special equipment and general anesthesia, so it is offered only in limited facilities. Ventricular septal defects are the most commonly reported congenital defect in horses. These developmental defects can range from life threateningly severe to incidental. Murmurs of VSD are typically ≥ grade 3 systolic right-sided murmurs that radiate toward the sternum. Many VSDs are small and restrictive, meaning the diameter is small enough that most flow through the defect is inconsequential. If the defect is large, the shunt volume can over circulate the lungs and the left heart and can ultimately lead to left-sided congestive heart failure (CHF). Alternatively, the aortic valve apparatus may be deformed and serious aortic regurgitation may result leading to CHF. Complex congenital defects are most often seen in foals and are usually life theatening, causing early death. Echocardiography is extremely helpful in evaluating congenital cardiac disease. As horses age they may develop a chronic myxomatous valvular degeneration that primarily affects the aortic and mitral valves. Valvular degeneration can lead to incompetency, murmurs and, if regurgitation is severe enough, CHF. Treatment of heart failure in horses is typically limited to the use of furosemide, digoxin, and occasionally angiotensin converting enzyme inhibitors. Dilated cardiomyopathy is virtually the only cardiomyopathy seen in horses and has been associated with CHF. The prognosis is poor for this condition and therapy for CHF is the only course.